An array A containing heights of building was given. Its a rainy season. Calculate the amount of water collected between all the buildings. The first line of input contains an integer T denoting the number of test cases. The first line of each test case is N, N is the number of buildings. The second line of each test case contains N input H[i],height of buildings. Print the amount of water collected between all the buildings. 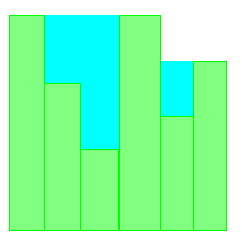 Testcase 1: Water are trapped by block at index 2 (0-based indexing) only and can trap 2 units of water.